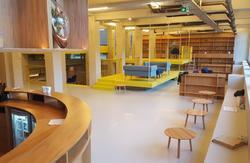 The hostel mixes Dutch style with creativity and modern comforts, providing curious travellers with a unique and fun place to stay and socialise and the perfect launch pad from which to explore all that Amsterdam has to offer. Beautiful features from the original 1920â€™s building have been enhanced whilst creating relaxing social areas, a plant-filled atrium, a cafÃ©, a library, a bespoke self-catering kitchen where guests can make and share food, and flexible spaces for meetings and events. ZincBAR puts on regular live music, DJs, talks and performances. Tickets for attractions and tours are also available in the hostel. 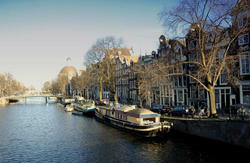 Staff are friendly, multi-lingual and always in the know about all things â€˜Damâ€™ related. Theyâ€™ll be happy to help you get the most out of your stay. The hostel is accessible to wheelchair users via an entrance at the rear of the building. Rooms 105,205 and 305 are equipped for wheelchairs. Full payment will be taken 48 hours before arrival. Check in from 14:30 to 00:00 . Bookings can only be made by those aged 18 years and over. Anyone between the ages of 16 to 17 must be with accompanied by an adult (18 and above)in the hostel. Any guest under 16 must be accompanied by an adult and booked in a private room or take over a whole dorm. From Amsterdam Centraal Train Station, follow the signs to the West Exit, then those that say â€˜Noordâ€™. Here, jump on the free 5 minute ferry to â€˜Veer Buiksloterwegâ€™ that runs every 7 minutes during the day (make sure you take the correct boat as one also goes to NDSM Werf). 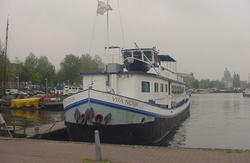 Boats are a bit less frequent in the evenings so be smart and download the timetable to check your journey http://www.ilovenoord.com/ferry/. Good news, youâ€™re almost there! As you step off the boat, walk straight along the road in front of you, passing the cafÃ©s on your left until you reach a car park. Take a left turn just after the car park and keep walking until you have crossed the bridge that leads to the other side of the canal. Once here, turn left and walk down the side of the large brown building until you reach a door on your right. Here youâ€™ll find ClinkNOORD!